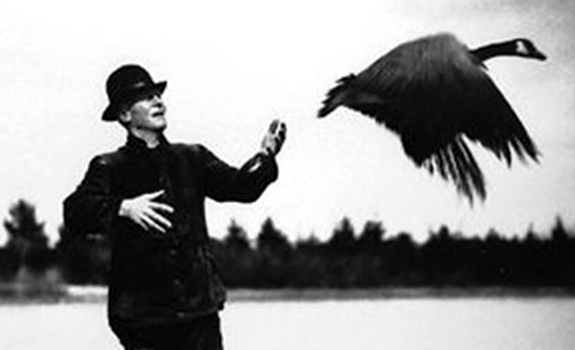 On April 10, 1865, Canadian naturalist, Jack Miner was born. At 39, he established the Jack Miner Bird Sanctuary for the conservation of migrating Canada geese and ducks on an Ontario peninsula between Lake Erie to the south and Lake Saint Clair to the north. Researching migratory patterns and championing waterfowl refuge management, Miner helped determine migratory waterfowl flyways. Starting with the 1st completed record for migratory bird banding — one of his hand-stamped aluminum bands with contact information recovered in South Carolina — Miner’s efforts produced extensive data that contributed to the Point Pelee National Park designation and the U.S. Migratory Bird Treaty Act of 1918. In 1947, Canada’s National Wildlife Week Act passed unanimously to be observed yearly in the week of Jack Miner’s birth. This year, it is celebrated from April 8th to April 14th. This entry was posted in On This Day and tagged April 10, Jack Miner, migratory birds, National Wildlife Week, On This Day, The Roberta Bondar Foundation, waterfowl conservation. Bookmark the permalink.